The 25.3 metre sailing yacht Mustang, listed for sale by Ann Avery at Northrop & Johnson, has been sold in an in-house deal. Mustang was built in GRP by Southern Ocean Shipyard and fitted out by British yard Camper & Nicholsons in a traditional teak interior to a design by Doug Peterson and David Alan-Williams with a launch in 1987 and a full refit in 2012. She offers accommodation for six guests in a full-beam master suite, double and a twin cabin, all with en-suite facilities. Mustang has an enclosed pilothouse that is also an upper saloon opening to a lower saloon below. During the 2012 refit, her rig was serviced, the hull and superstructure repainted, the engine was rebuilt and the exterior varnish was stripped and renewed, meaning that she is now absolutely ready to go for the coming season. 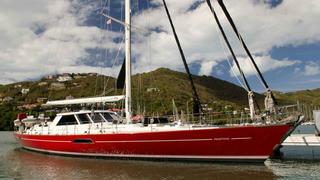 A proven and safe world cruiser, she has four circumnavigations to her credit. Featuring a totally enclosed pilothouse, Mustang was built on a racing hull that gives performance sailing. A single Cummins diesel engine gives her a cruising speed of 8.5 knots under power.